oh, those kahles ...: 63 - 50 = ? 63 - 50 = ? You can see the exciting cities that I keep on my weather chart in my phone ... Fresno, Kris? Really? Heck yeah. I've got some good friends there and I always need to know that it's a whole degree warmer here than there. Now that bottom city? Spokane? Seriously? 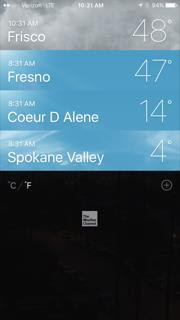 I'm headed to Spokane in three weeks and it'll be FOUR DEGREES. Wait, that's now. It'll probably be a tad less than that in three weeks. I will get a taste of ol' Spokane very soon, though. In fact, tomorrow. I'm working in Oklahoma on Saturday and it's supposed to be a toasty 6 degrees by the time I get off work at midnight. Heck, Rick better be worth it. Know something funny? 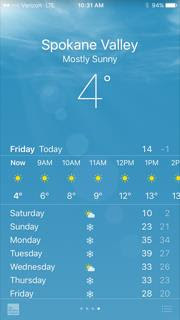 4 degrees in Spokane and it's MOSTLY SUNNY!